I'm a huge Toy Story fan and when my friend Rachel said she was going to have me photograph her newborn, I knew I wanted to do something fun. I looked on Pinterest and couldn't find any Toy Story newborns. So as I was watching the movie, the "Sunnyside" box inspired me on what to put her little girl in. We spelled out "Skylar" in the blocks. And used some toys from my personal Toy Story collection. I made the clouds in Illustrator and had them printed on a background. It says "Andy" on her foot. BuzzFeed did a "geeky newborns" piece and this photo was featured. 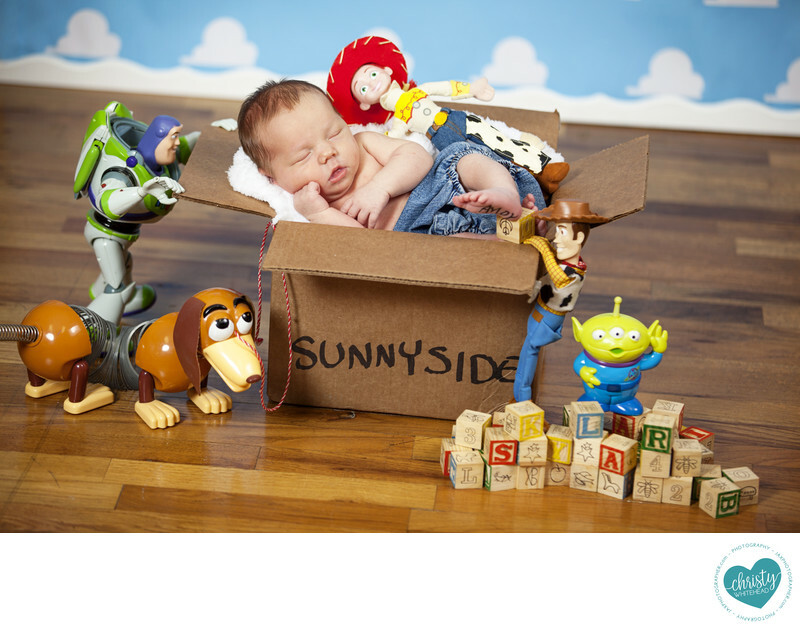 Nowadays, if you search Pinterest for a Toy Story newborn session, there are a TON of people copying this shot. I find it funny. I guess imitation is the purest form of flattery. Location: 514 Chaffee Point Blvd Jacksonville Fl.